The IRS commissioner faced lawmaker questions on the request on Wednesday. "The legal implications of this request could affect protections for all Americans against politically motivated of personal tax information, regardless of which party is in power," Mnuchin wrote in a letter to House Ways and Means Committee chairman Rep. Richard Neal, D-Mass. In doing so, the president reiterated his oft-cited rationale for withholding his tax information -- claiming they were under audit -- although that has never been confirmed. 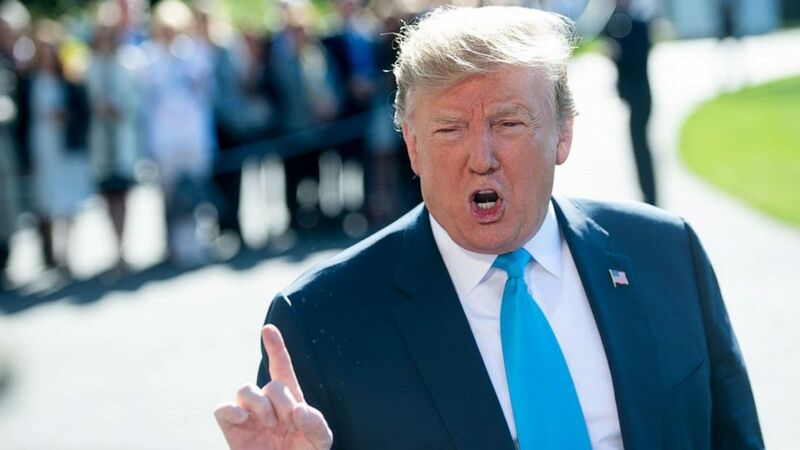 (Saul Loeb/AFP/Getty Images) President Donald Trump speaks to the press prior to departing on Marine One from the South Lawn of the White House in Washington, April 10, 2019. But less than 24 hours earlier, the president’s IRS commissioner, Charles Rettig, told lawmakers there are no rules prohibiting taxpayers under audit from releasing their tax information. President Trump on his tax returns: "I would love to give them, but I'm not going to do it while I'm under audit." "I think I've answered that question,” Rettig told the House Appropriations Committee during a budget hearing on Wednesday. “No,” he said. Rettig faced a Wednesday deadline to respond to a letter from Neal who last week formally requested Trump’s business and personal tax information dating back to 2013. In a hearing Wednesday morning before the Senate Appropriations Committee, Rettig declined to say whether he would comply with Democrats' request. “We received the letter, we’re working on the letter with counsel, and we anticipate responding,” Rettig told the panel. The White House has repeatedly rebuffed calls to release the president’s tax returns, maintaining its position that any effort to disclose them amounts to little more than partisan politics. In a letter to the Treasury Department’s general counsel last week, a new lawyer for Trump, William Consovoy, called the move by Democrats "a gross abuse of power" and encouraged the IRS to "refrain from divulging the requested information."